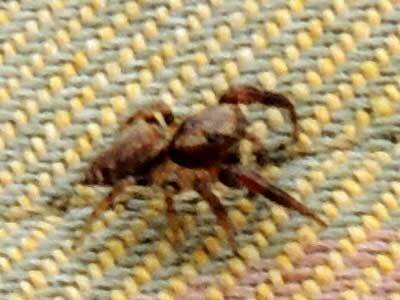 This small male spider found itself upon a hiker's shirt, possibly having been knocked from vegetation in Nairobi, Kenya. March 2013. Length about 7 mm. Jumping Spiders, Salticidae, have abandoned the use of silken snares to capture prey, but, nonetheless, make multiples uses of this fibrous protein. Firstly they build a silken tent, often within a leaf, in which to hide through the night. If they get dislodged from a plant they almost always have a safety line of silk to let out in order to catch their fall and allow them to return to their former position. Salticids hide at night because they are creatures of day, when they can make maximum use of their advanced visual system. Once they spot a suitable prey insect they stealthily advance and then leap upon it with great precision from a considerable distance. The spider at right is a male and was probably out looking for a mating opportunity. It has special markings on its boxing glove palps disigned to signal a female that he is not to be considered a prey item.